I know that a lot of people use their slow cooker through the week so that when they come home from work, dinner is ready. I get it. Been there, done that. But there is also something so satisfying about putting something in your slow cooker or crockpot on a Saturday or Sunday morning and going about your day. If you’re puttering around the house, the aroma follows you in and out of rooms. Or maybe you leave the house, go out and have some fun. Maybe hike a little. Rake the yard. Plant some flowers. You come back inside to grab a cold one from the fridge, and as you sniff the air, you are reminded that dinner is cooking. Right now. While you are going about your day. That’s where this Picadillo from Eating Well comes in handy. Cooks all day. Smells so good. All you have to do is cook up some rice and you have dinner. A few notes: it calls for 2 cups of chopped seeded Cubanelle or Anaheim peppers – believe them when they say seeded. I didn’t and this turned out quite a bit spicy. This was the perfect way to use up the bag of Anaheims that I had in the freezer. I grow them all summer and just lightly wash them off and place them whole in a ziplock freezer bag and then use them all winter. Perfect. 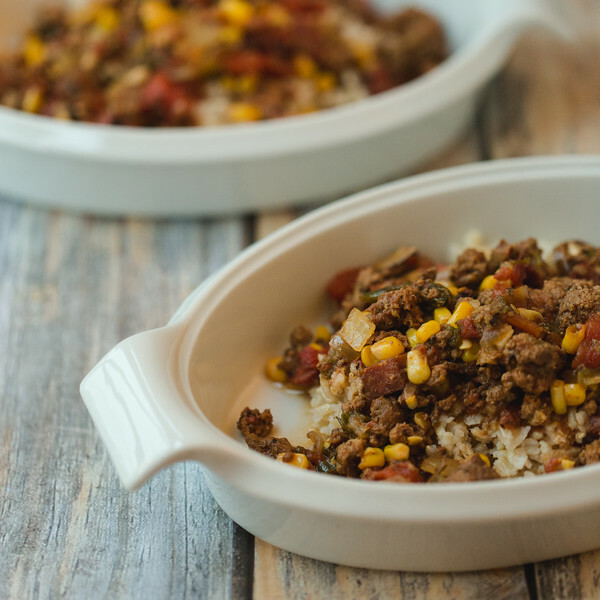 All the flavors of a great picadillo cook all day in the slow cooker! Add the oil to a large skillet over medium-high heat. Add the beef (or bison) and brown, breaking up the clumps with a wooden spoon. Drain off fat (I didn't my meat was grass fed and not very fatty). Add the chili powder, cumin seeds, oregano and cinnamon. Cook for a couple of minutes, stirring to combine. Then add the water, tomato paste, and vinegar, stir and then spoon out into the slow cooker. Add the onions, peppers, corn, green olives, garlic, tomatoes with their juice, and salt and pepper. Cook on high for 4 hours or low 7-8 hours. 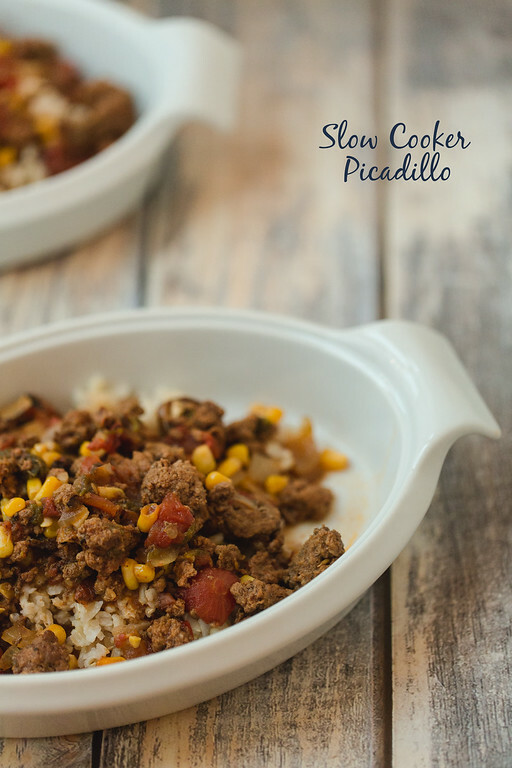 Slow cooker picadillo looks delicious, thanks for sharing with Hearth and soul blog hop, pinning. tweeting and sharing it in google plus. This is definitely a different version of picadillo from what I’m used to, but it sounds amazing! Can’t wait to try it! ohhh my goodness these look amazing!! Definitely adding to my to-crockpot list!! For a moment there I thought a picadillo was a creature of some kind (like a cousin of the armadillo). My crock pot is used most weekends through winter. I love putting something on in the morning and coming home to soup or casserole. Sounds delish to me! Does it need a squirt of lime to just set it off? My mouth is watering…and it’s 11:00 p.m. I love using the crockpot while at home…I also have to. The cat will lick the condensation off the top during the day if I am not at home to prevent her from being a little twit!!! I definitely do like the idea of being home to smell whatever’s in the slow cooker cooking all day…otherwise no one gets to appreciate it!